A. Lange & Söhne has reissued its classic Langematik Perpetual 18 years after its introduction in a limited edition, equipped with a sophisticated honey gold case and slightly reworked some of the decorative elements on the dial. The watch manufacturer’s glorious history dates backt to 1845, when it began its second golden age in 1994. 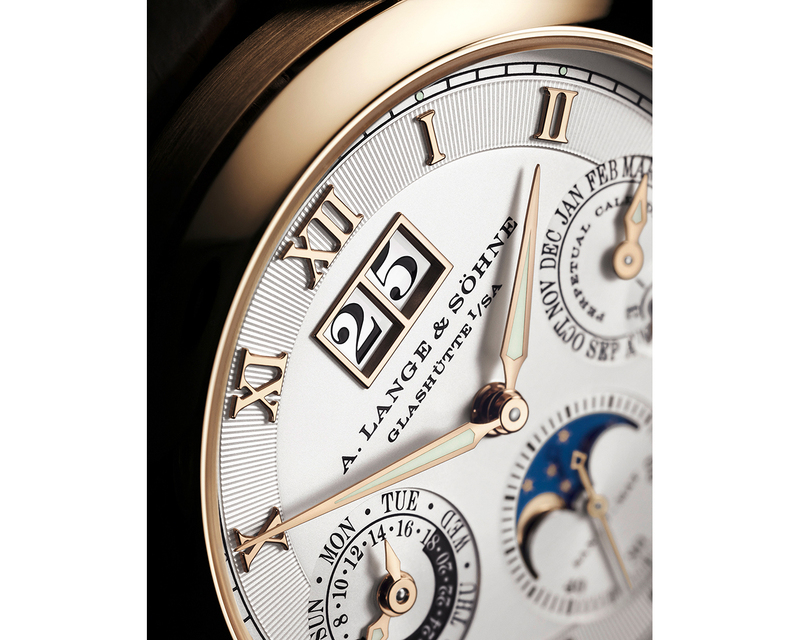 In the 25 years that followed, a. Lange & Söhne succeed in becoming an icon of the German art of watchmaking, which among other things produces one of the best perpetual calendars around. The honey gold used by A. Lange & Söhne for the case and details on the dial is an alloy that is proprietary to the manufacture and reserved exclusively for the company’s most exclusive models. But this gold was not only created for aesthetic purposes; it is also more scratch-resistant than conventional gold alloys – or platinum. Less brass than yellow gold, warmer than white gold and less copper than red gold, this alloy manages to charm everyone. The only disadvantage of honey gold is that it is extremely difficult to process. This is one of the reasons why A. Lange & Söhne does not use it in its normal production. Thanks to the honey gold case, the new Langematik Perpetual can be seen as even more elegant than its predecessors. A. Lange & Söhne has polished the bezel and lugs. With a diameter of 38,5 mm and a height of only 10,2 mm, the case is very understated proportioned. The solid silver Argenté dial once again reveals the attention to detail for which A. Lange & Söhne is renowned. Against its background, the hands and Roman numerals in honey gold clearly stand out. The embossed circle of hour indexes further enhances the plastic effect. 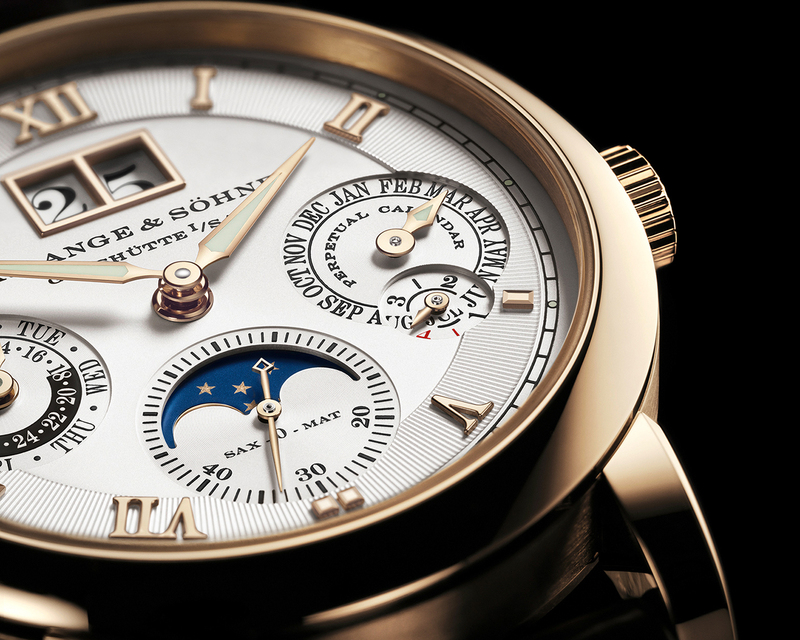 In order to achieve ideal legibility, A. Lange & Söhne has equipped the hands with lume. The characteristic oversized date window dominates the upper third of the dial. An auxiliary dial at 9 o’clock displays the day of the week and the day/night indication, while a second dial at 3 o’clock displays the month and – slightly offset downwards – the leap year. a third subsidiary dial at 6 o’clock offers space for the small second and the moon phase display. It is also designed for long periods of time and only needs to be adjusted by one day every 122,6 years. The Langematik Perpetual demonstrates the full mastery of Lange’s craftsmanship and perfectly displays the date up to the year 2100 without the need for adjustment. Correctly set, the date at 12 o’clock does not have to be manually corrected until 2100, as this does not include February 29 due to an exception in the Gregorian calendar. A. Lange & Söhne is using the same calibre in the new Langematik Perpetual in honey gold that powers the first 2001 model – the L922.1 SAX-O-MAT. The movement scores with a power reserve of 46 hours, is beautifully decorated and can be seen through the sapphire crystal back. 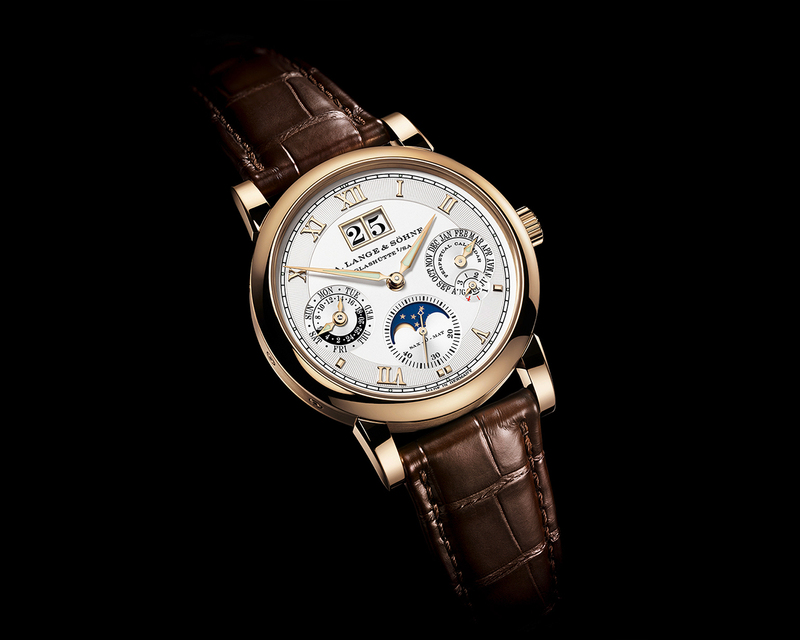 The A. Lange & Söhne Langematik Perpetual Honey Gold is a limited edition comprising only 100 pieces. 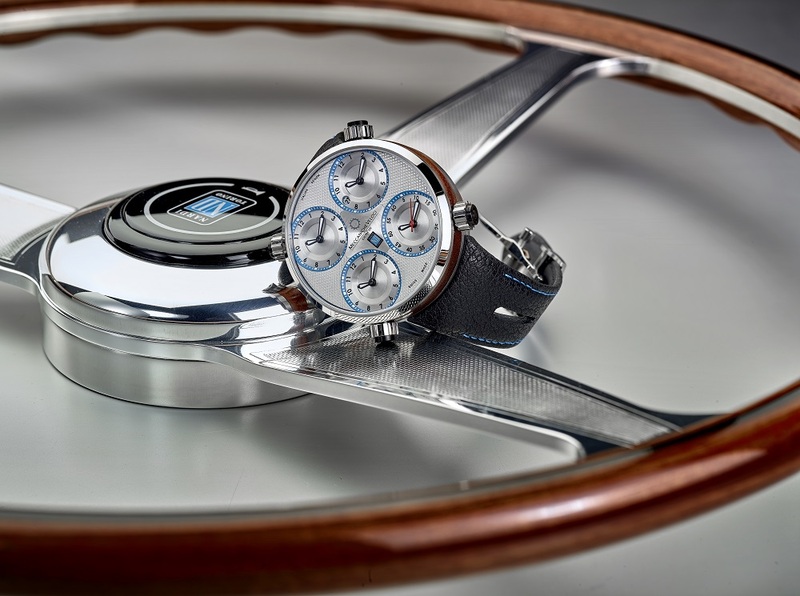 Watch manufacturer Meccaniche Veloci presents a unique new timepiece from the QuattroValvole collection, the fruit of a collaboration with Nardi, the Italian firm known for making traditionally crafted steering wheels and working with the greatest names in the automobile industry (let us just say: Ferrari) for more than ninety years. The result of this cooperation is the QuattroValvole Nardi Edition. With shared conceptual and stylistic intentions, the new timepieces represent the passion that the two brands share for the world of beautiful vehicles, as well as attention to detail. Drawing on their Italian roots, Meccaniche Veloci and Nardi have a joint philosophy: producing high-quality creations through the use of selected materials, specific production processes and unique style and design. The watch dial presents an opaque surface with a delicate guilloché weave. As well as demonstrating the high quality of traditional watchmaking, this finish also renders the dial more precious and clearly recalls the harmonious design of Nardi’s most exclusive pedigree steering wheels that are still hand-crafted to this day. Four small dials edged in blue in tribute to Nardi’s colours stand out against the QuattroValvole dial. The two brands’ logos appear at the centre. All the hours and minutes hands are coated with Super-LumiNova and the seconds function is fulfilled by the small red hand at the bottom right of the dial, while the date may be read through a circular aperture with the dial above. 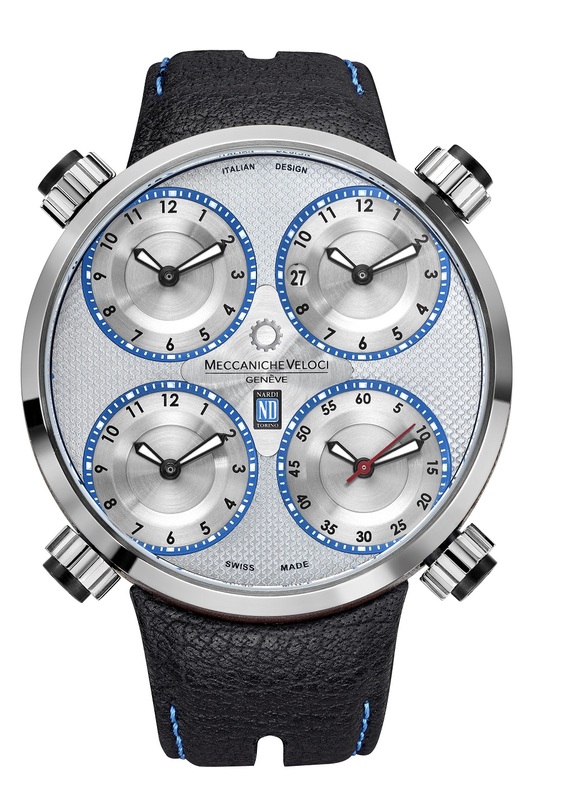 The Meccaniche Veloci QuattroValvole Nardi shows four independent timezones; the main dial shows hours, minutes and the date. Featuring a 49-mm-case with anti-reflective sapphire crystal, the QuattroValvole Nardi watches are driven by the calibre MV8802. The in-house calibre allows two different time zones to be displayed simultaneously and independently, an expression of both the fleeting nature of time and space and their precise mastery. On the case (which is water-resistant up to 5 atm, by the way), four crowns positioned adjacent to the four dials allow each individual time zone to be adjusted. The automatic movement works at a frequency of 28,800 oscillations per hour and provides a power reserve of approximately 48 hours. The strap is directly attached to the case via a system that does not require lugs. Meccaniche Veloci opted for black leather with green stitching and a steel folding clasp. Von der Meccaniche Veloci QuattroValvole Nardi gibt es nur 50 Stück. This October, Hanhart introduced a new limited editions for adrenaline junkies and car lovers, for racecar drivers or simply the modern man with a need for speed. 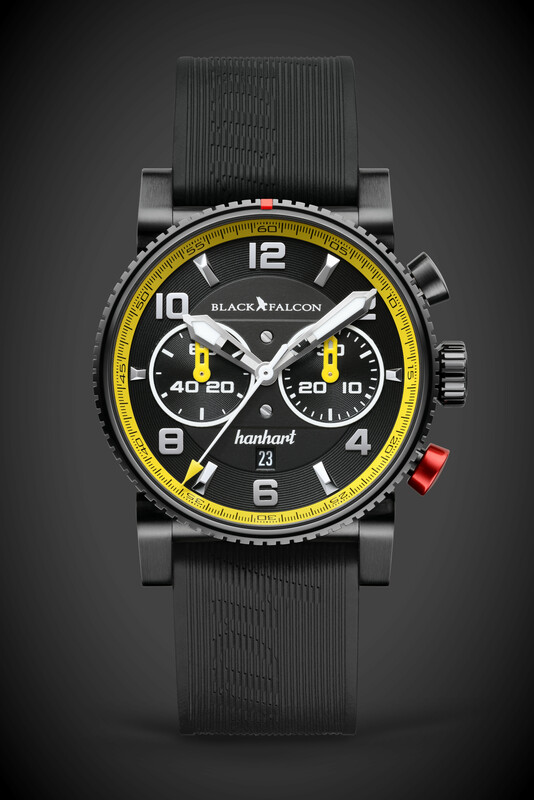 It is created by Black Falcon, the young motorsports company currently celebrating both national and international success, in cooperation with watch manufacturer Hanhart. The fusion of Black Falcon’s progressive design and technology with Hanhart’s more than 130 years of tradition offers unmistakable sportiness and maximum wearing comfort. 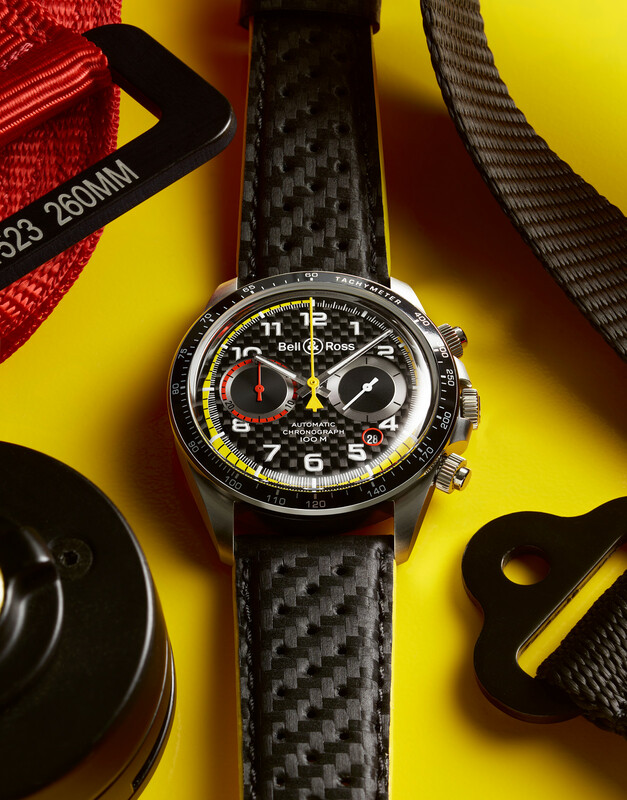 The result is the Black Falcon Primus Race Winner, a chronograph which is dedicated to the Black Falcon team’s many first-place victories in international motorsports. The black dial is partly structured and since the Black Falcon Primus Race Winner is a chronograph, it comes with two subdials. You’ll find the small seconds at 9 o’clock and a 30-minute-counter at 3 o’clock. At 6 o’clock a small, an unobtrusive date window was placed. The watch is excellent legible and not only during the day; the big Arabic numerals are not only polished but coated with Super-LumiNova, as are the index marks and skeletonized hands. The yellow details are beautiful and stop the chronograph from getting too dark. The dial is protected by a convex sapphire glass with anti-reflective coating. The Black Falcon Primus Race Winner is based on the iconic design of Hanhart’s Primus watches. It comes with a stainless steel case, measuring 44 mm in diameter, sporting a black DLC-coating. The fluted bezel comes with a red inlaid marking at 12 o’clock. The case is water-resistant up to 10 bar and sports the attention-grabbing trademark of Hanhart, the red button which underlines the connection between stopwatches, the first pilot’s chronographs and the new collection. Inside lies the calibre HAN3809. The automatic chronograph movement works at a frequency of 28,800 vibrations per hour and comes with a very mediocre power reserve of 42 hours. The Black Falcon Primus Race Winner is a limited edition watch with only 111 pieces. Every one of these watches stands for a victory the Black Falcon team achieved and comes on a black vulcanized rubber band. 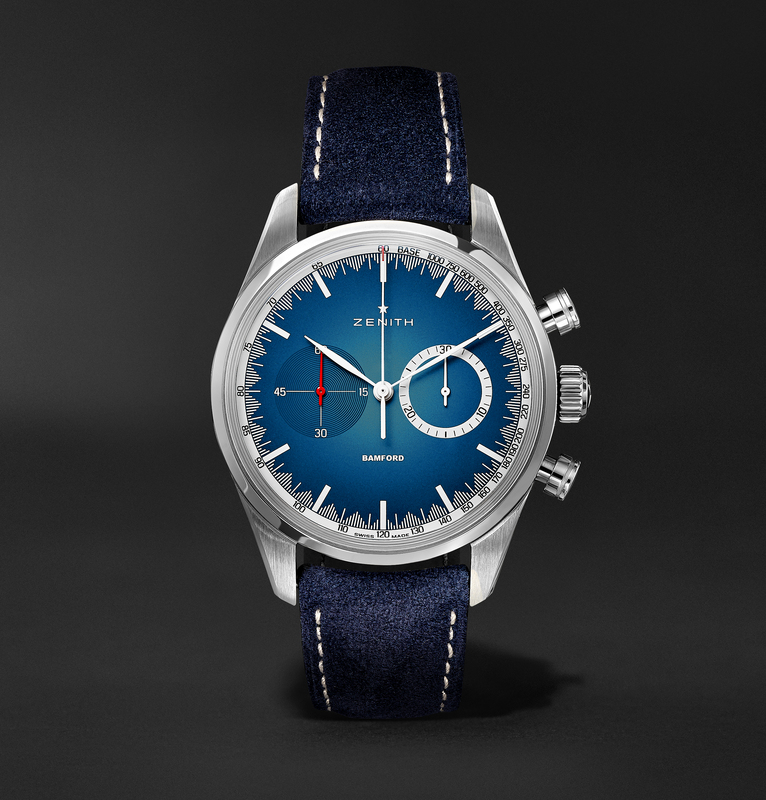 Mr. Porter, one of the online destinations for men’s style, has announced that it has partnered with Swiss watch manufacturer Zenith and British watch customiser Bamford Watch Department in creating a new watch. Co-creating a project and product of this nature is a first for all three partners in this undertaking. 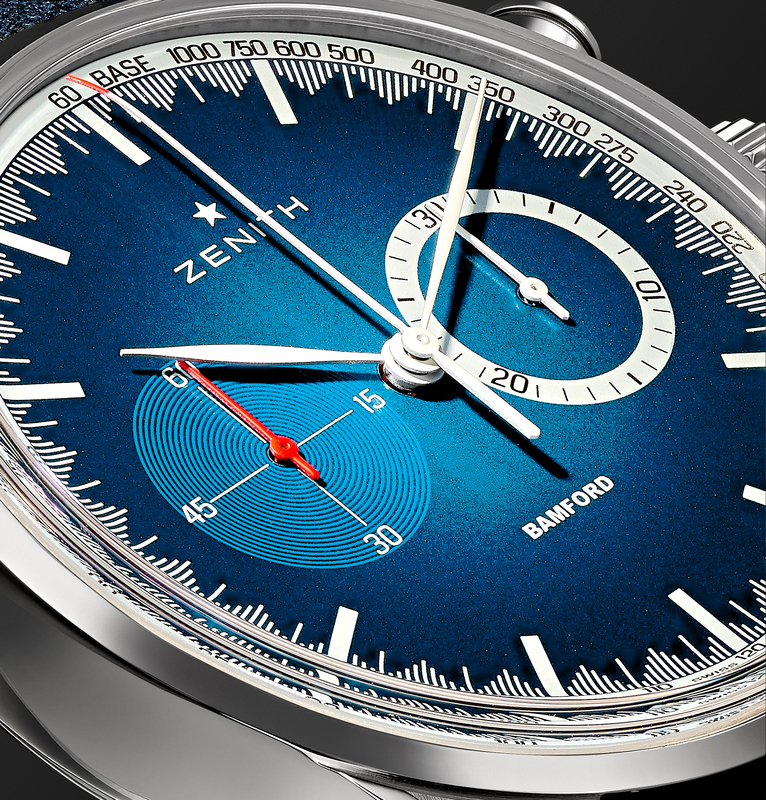 Mr. Bamford and his team worked alongside Zenith in the design of the watch, which was then entirely developed and produced in-house at Zenith’s Manufacture. Based on the Zenith Heritage 146 model, the Chronomaster El Primero Mr. Porter takes cues from several of the brand’s historical design elements. These subtle touches include the tachymeter inspired by a 1971 El Primero, a red seconds hand, aesthetic reminders of a vintage chronograph case and centric sub-dial rings hark back to the old Zenith recorder tell-tales and motion detecting clock. Its unique dial comes in the colour “Solar Blue”, also sporting a terrific colour gradient. The Chronomaster El Primero Mr. Porter comes with a central hour and minutes hand, as with a central chronograph seconds. 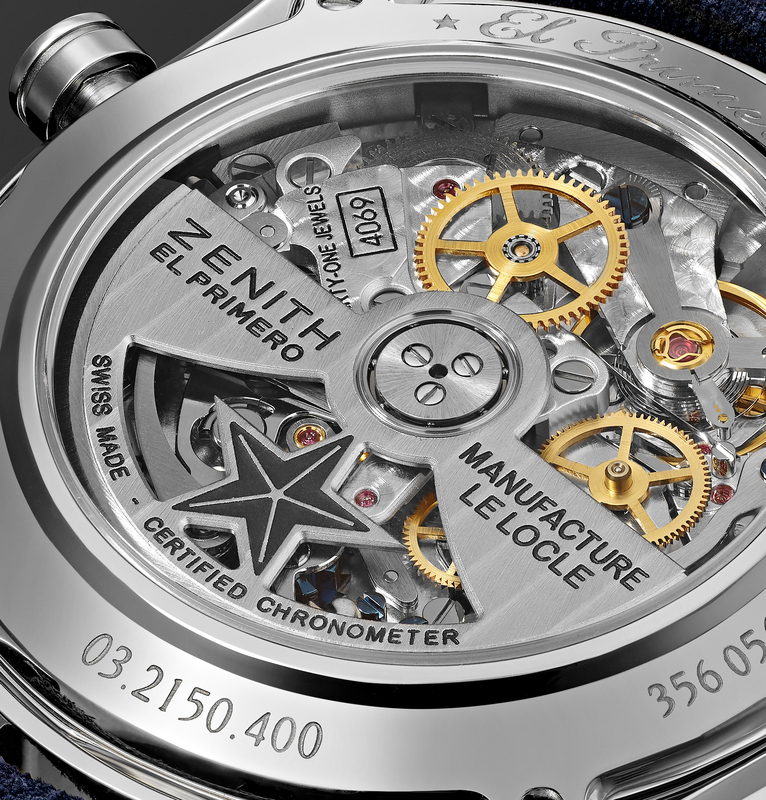 At 9 o’clock you’ll find the running seconds, at 3 o’clock Zenith has placed the 30-minute-counter of the chronograph. No date window disturbs the beautiful synchronicity and balance of the dial. The most distinctive feature – and our favourite by far – are the unusual minute-markers and the internal tachymeter scale. The latter makes for a clean, sleek bezel. Above the dial arches a domed sapphire crystal with anti-reflective treatment on both sides. The stainless steel case sports an universal diameter of 38 mm and is water-resistant up to 10 atm. 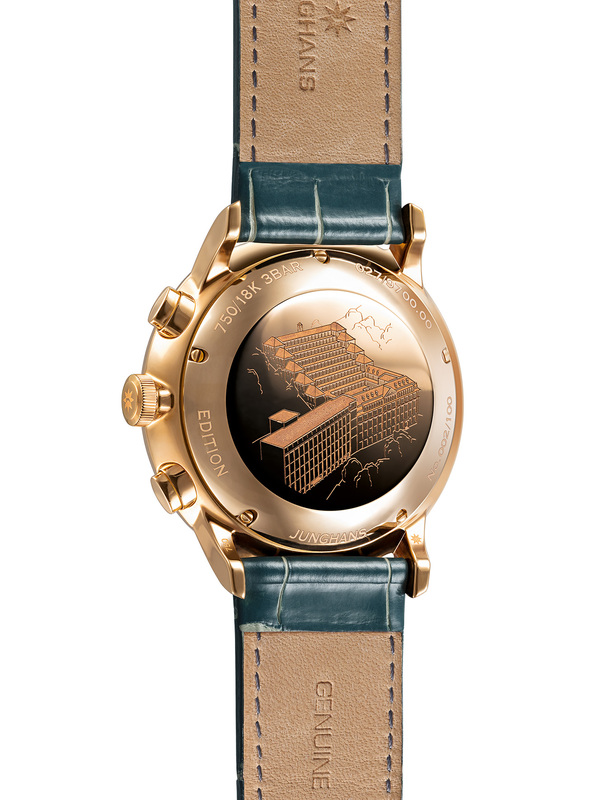 The case back is transparent and engraved so the owner can observe the oscillating weight with Côtes de Genève motif. The Chronomaster El Primero Mr. Porter is powered by the powerful calibre El Primero 4069. It works at a frequency of 5 Hz and provides a power reserve of at least 50 hours. The Chronograph comes with a blue Alcantara strap featuring white stitching designed to complement the white dial markings. Each of these 25 limited-edition watches will be exclusively available on Mr. Porter. Sculpture gives mass meaning. 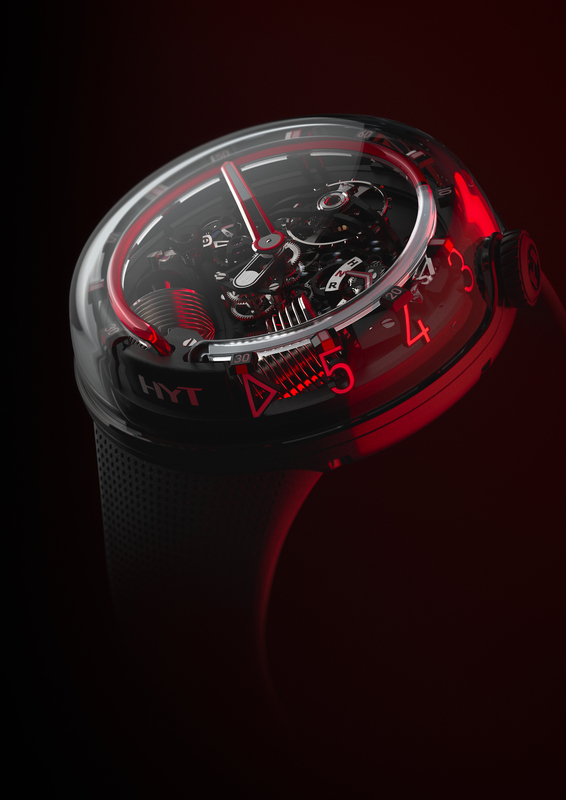 The latest H20 from HYT looks to this visual art that operates in three dimensions to shed light on the essence of time. Viewed from any aspect, the sculpted timepiece unveils new angles on time, while colored and clear liquids keep its essential flow permanently present. Second by second, further layers of time are revealed, witnessed and anticipated. The all-black color-scheme, right through to the coating of the movement’s bridges, intensifies the visual drama between mystery and transparency. This intrinsic interplay of time and space brings to life the core HYT belief that time is defined by content and context. These timepieces represent the culmination of a quest to define and capture the essence of time. Its conclusion is clear: the time is now – always. In these two new limited editions of the H20, the three-dimensional quality of the design acquires additional visual tension. A striking contrast between black diamond-like carbon coating and the doomed crystal hosting apparently floating digits. The whole presents an architectural entity, tempting the eye to take a new perspective on time – and watchmaking. The skeletonized numerals ring features white lacquered interior and black indices. The minute hand as well as the HNR hand are equipped with Super-LumiNova. The stainless steel case combines polished an satin finished surfaces and features a diameter of 51 mm while measuring 19.95 mm in height. The case is water resistant up to 3 atm. The blue (and red) liquid traces the path of time’s recent journey while replacing the clear liquid beyond the meniscus. The liquids are pushed through the capillary tubes by multi-layered metal bellows. 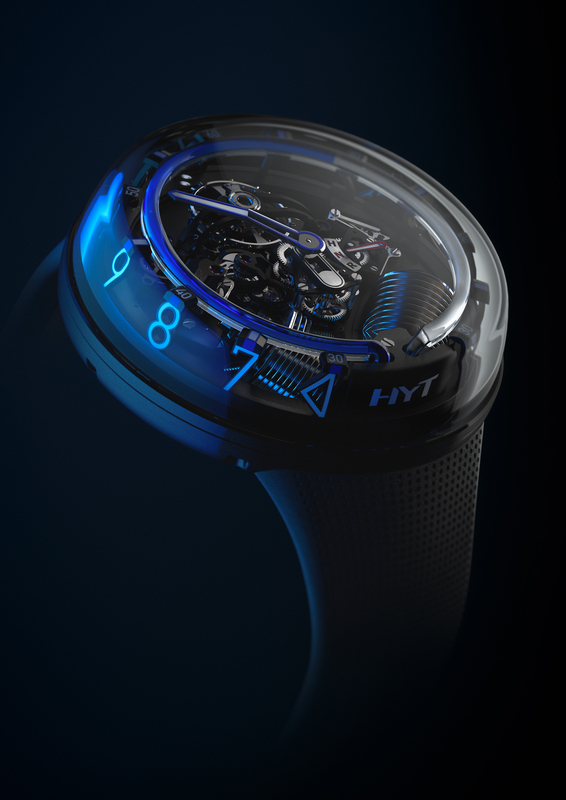 The patented fluidic module works in collaborates with a mechanical movement exclusively developed for HYT by APRP. Seamless transition between these two protagonists is assured by the conversion of rotation into linear motion via a cam-follower system. This calibre works at a frequency of 3 Hz and boasts a gigantic power reserve of 192 hours. 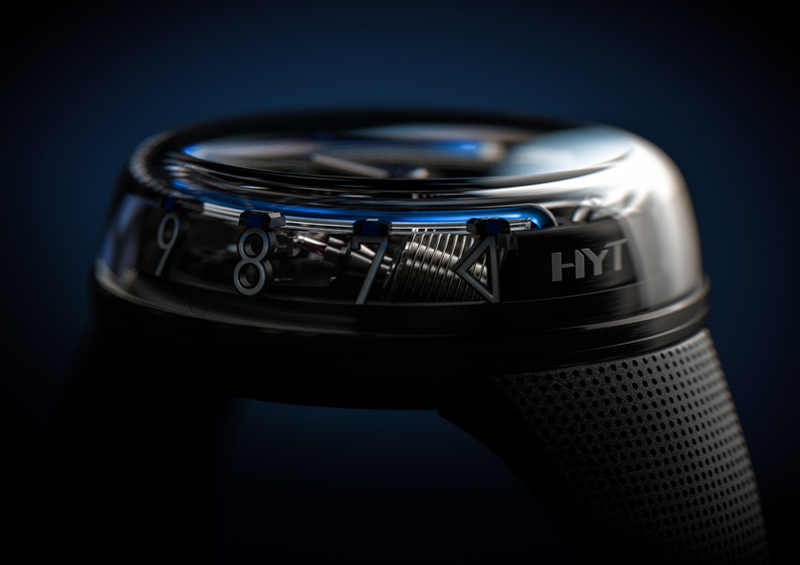 The HYT H20 comes with a black rubber bracelet. The watch is a limited edition of only 10 pieces, so if you really want one of these, you better hurry. Bell & Ross, the official partner of the Renault Sport Formula One Team, celebrates reopening the French Grand Prix with its first presentation of a Vintage model from the collections linked to the partnership. This watch is an invitation to get behind the wheel of a racing car and experience the extreme sensation felt by the driver, for whom a watch is not only a tool, but also an ally at each and every moment of the race. 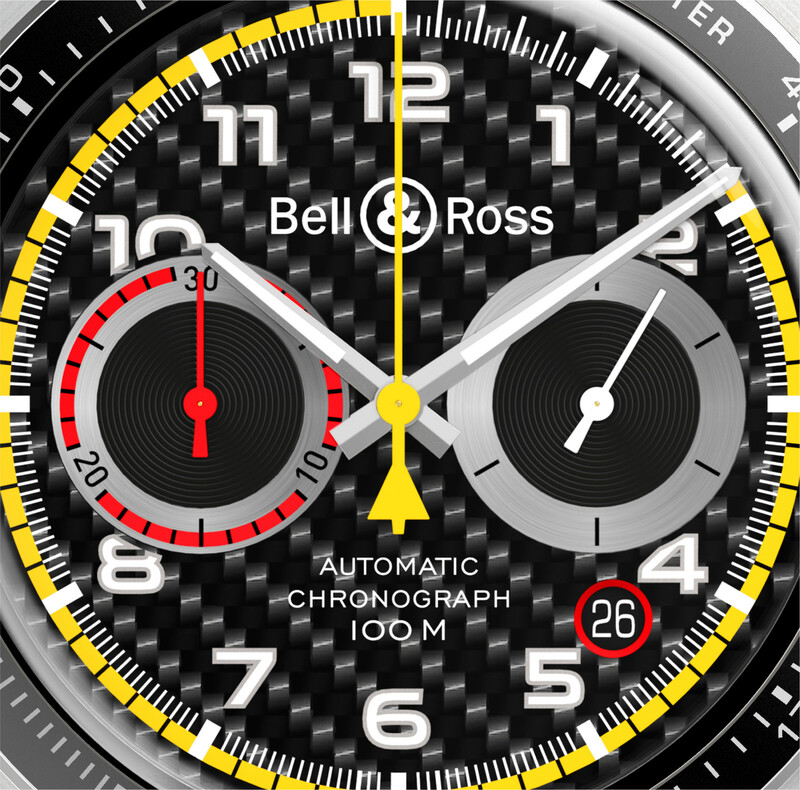 Linked by the values of high precision and excellence, the partnership between Bell & Ross and the Renault Sport Formula One Team is a continuous source of inspiration and motivation for the watch brand. This Vintage BR V2-94 R.S.18 model immerses us in the world of motor racing adoption Formula 1 racing codes. It features a 41 mm case in satin-finished steel which is water-resistant up to 100 metres. It features a steel bezel with an anodised black aluminium ring with a tachymeter scale. The BR V2-94 R.S.18 features a carbon fiber dial with applied numerals are filled with Super-LumiNova, so are the metal skeletonized hour and minute hands. This makes the watch extremely legible even in the dark. Since the BR V2-94 R.S.18 is a chronograph, it shows hours, minutes and small seconds at 3 o’clock. The date window lies at 4.30 and wears a little red highlight. The 30-minute timer at 9 o’clock also comes with red highlights. 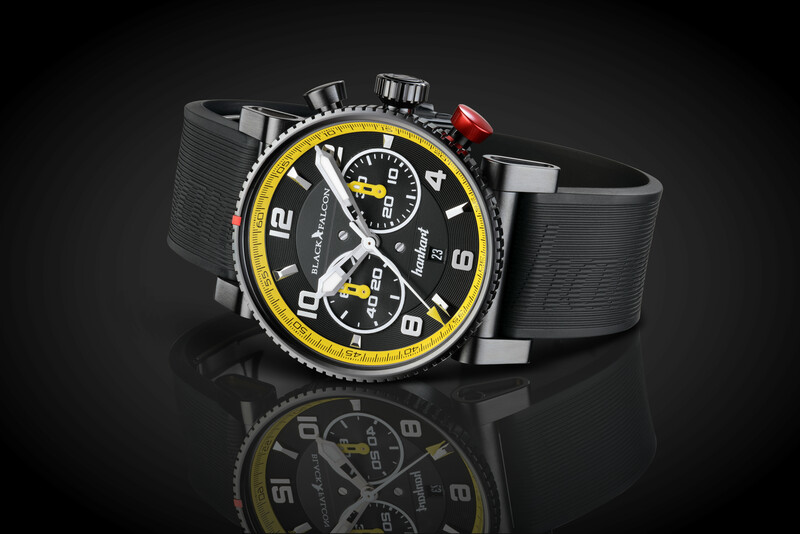 The bright yellow central seconds hand belongs to the chronograph as well which matches the internal minute track. The dial is protected by an ultra-curved sapphire with anti-reflective coating. The wristwatch is powered by a Swiss-made automatic movement, the calibre BR-CAL.301. The BR V2-94 R.S.18 is available with a micro-perforated calfskin strap with carbon fiber effect and yellow lining or a bracelet in satin-finished polished steel. To mark the return of Formula One to France, the BR V2-94 R.S.18 is featuring a black rubber strap stamped with the French flag during the French Grand Prix. This is a limited edition of 999 pieces. Bremont adds a striking and technical dive watch to its collection, the Limited Edition Bremont Waterman. The mechanical chronometer follows an impressive line of marine predecessors which have built a reputation for durability and precision within the range. Bremont has worked closely with the world renowned free-diver, adventurer, big-wave surfer and ocean environmentalist, Mark Healey, in testing this new timepiece. Limited to 300 pieces, the beautifully engineered new Bremont Waterman incorporates a GMT hand and features deep-blue applied indexes on the dial. Waterman uses the core S500 watch architecture as chosen by multiple military units and explorers all over the world. The open Sapphire backed 500 m water resistant case, helium release valve, anti-shock vibration mount and scratch resistant sapphire uni-directional bezel make it a watch that can be tested to extremes. The dial is neat and very readable. Hands and indexes are equipped with Super-LumiNova, making it easily readable in the dark. The blue and white theme makes for very a nice look. At 3 o’clock you’ll find a date window, and the forth hand, the red one), provides the second time zone, the GMT function. The Waterman comes with a satin and polished stainless steel case which features an uni-directional rotating bezel like all dive watches. You’ll also find an automatic helium escape valve and a crown protector. The case is water resistant up to 50 atm, which makes it a serious tool, suitable for almost every dive. Inside lies the modified calibre 11 1/4”’ BE-93-2AE, an automatic chronometer. This movement at a frequency of 4 Hz and provides a 42-hour power reserve. The modified and skeletonised rotor can be seen through the sapphire crystal case back; a rarity in dive watches. 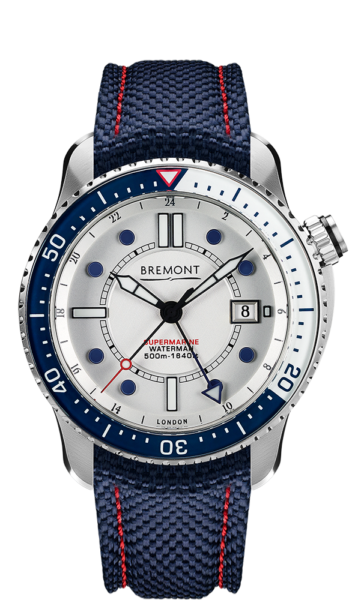 The Bremont Waterman is completed by a rubber or kevlar strap, both blue, to accompany the colors used in the dial and bezel. With more than 5 trillion pieces of plastic currently littering our oceans Bremont and Healey were keen to support a charity close to home for Mark with the release of its latest dive watch. A percentage of proceeds from all Bremont Waterman sales will go towards “Sustainable Coastlines Hawaii”. By doing so, the all-purpose Limited Edition diving watch hopes to add to the increasing awareness of the issues that our oceans are facing all over the globe. So, today it begins, the World Cup championship in Russia. A lot of watch manufacturers have presented special editions for this event (or interchangeable bracelets in team colours. 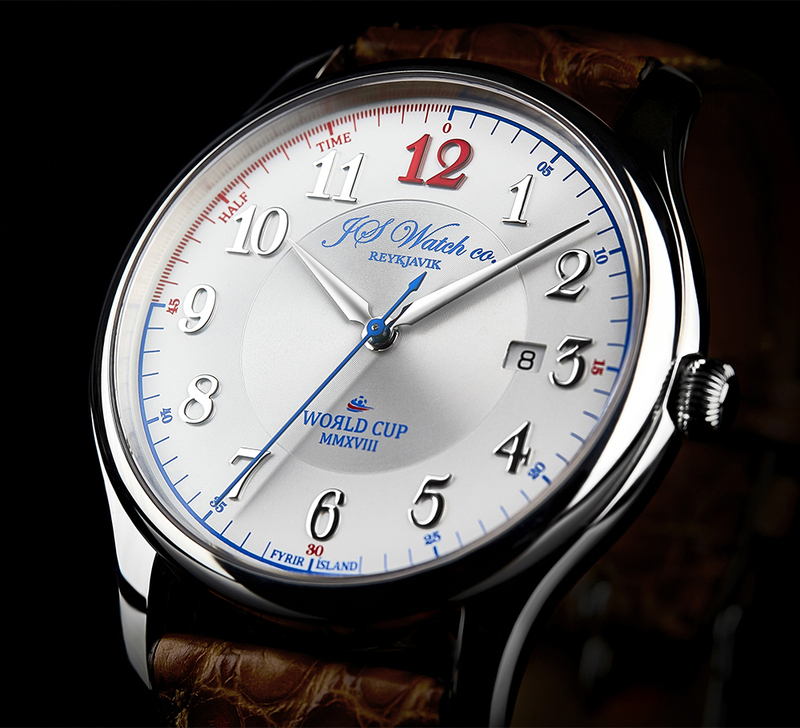 We will introduce the Limited Edition by JS Watch Co. Reykjavik, the COLLECTION WOЯLD CUP MMXVIII. Because it’s awesome and dedicated to everyone’s favourite underdog from the last UEFA Euro Cup: Icelands men’s national football team. With a population of around 330,000, Iceland is by far the smallest nation ever to qualify for the World Cup championship – and it’s the first time, the team managed to do so. If that’s not a reason to celebrate with a special edition, we don’t know what is. 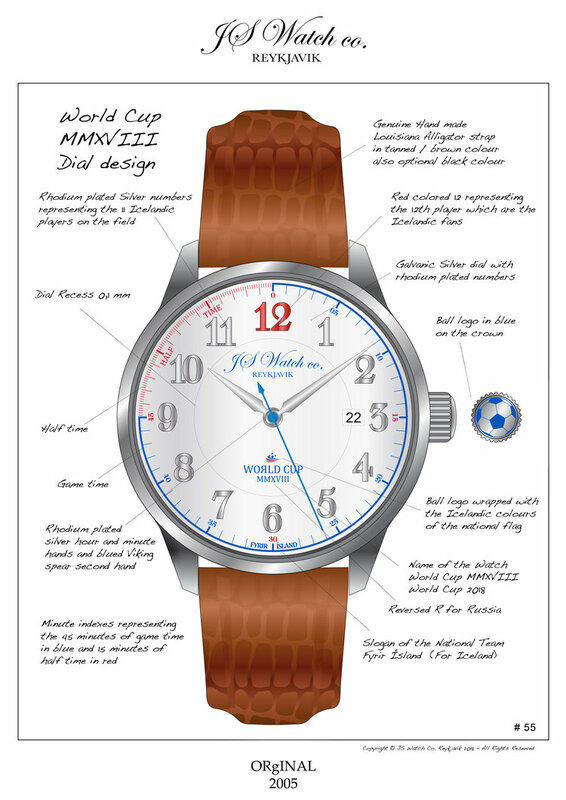 In this edition, JS Watch Co. Reykjavik has incorporated the colours of the Icelandic flag to honor the team. You’ll also find a lot of small details in the watch which reflect the spirit that has built up around the National team. In the dial design you will find small details like “Fyrir Ísland” (which translates into “For Iceland”). The numbers 1 – 11 are in silver for the players on the pitch, the number 12 is in red and represents the fans, who are called “Tólfan” (“The Twelve”); due to their undying support the fans are considered to be the twelfth player in the team. The minutes in blue from 0 to 45 representing the Game Time and the 45 to 60 minutes in red saying Half Time. This idea originally came from a game time clock that was located on the National stadium “Laugardalsvöllur”. Since for battle a weapon is needed, JS Watch Co. Reykjavik designed the blue seconds hand in the shape of a viking spear. The COLLECTION WOЯLD CUP MMXVIII logo sports a reversed R as a special memorandum for Russia, the nation hosting this years FIFA World Cup – and also to honor its special alphabet. 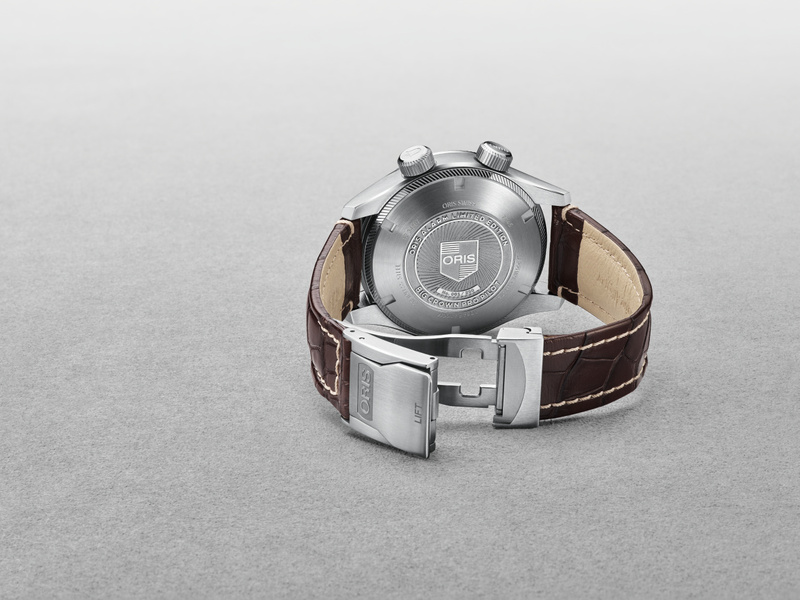 The back of the watch is engraved with JS Watch Co. Reykjavik, COLLECTION WOЯLD CUP MMXVIII and VAR ÞAÐ EKKI – the celebration chant the team whispers in the locker room after victories. A small engraved soccer ball on the crown filled with ceramic blue colour completes the design. The watch comes in a 43.3 mm steel case with a curved anti-reflective sapphire crystal and see-through sapphire crystal back. The case is water-resistant up to 5 atm. Inside works a Swiss made automatic movement which assures a 38-hour power reserve when fully wound. The watches are completed by a leather strap – calf, ostrich or alligator. 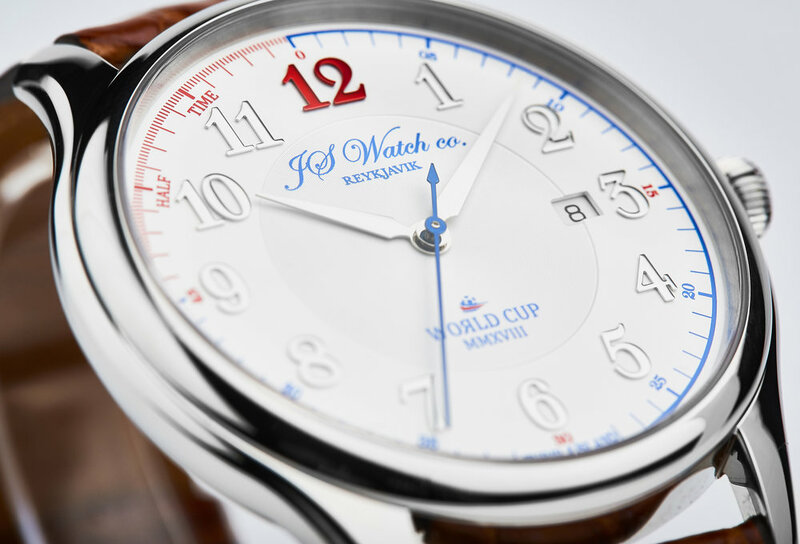 JS Watch Co. Reykjavik has limited the COLLECTION WOЯLD CUP MMXVIII to 300 pieces and the first 30 numbers are reserved for the National team members. Junghans introduced an anniversary watch last month to mark the centenary of an architectural masterpiece by Philipp Jakob Manz. The terrace building in Schramberg is one of the most spectacular industrial buildings worldwide to be built on a sloping site. At the beginning of the 20th century there was an increasing requirement for workplaces in the already cramped valley in Schramberg. The nine-stepped terrace building was built directly on the slope, in less than two years. As a result, each watchmaker could benefit from direct daylight at the workplace. For decades, the building was the centerpiece of the Junghans factory. 2018 sees the monument to industrial architecture celebrates its 100th birthday, with 100 years of architectural history commemorated with a special timepiece – the limited edition Meister Chronoscope Terrassenbau. 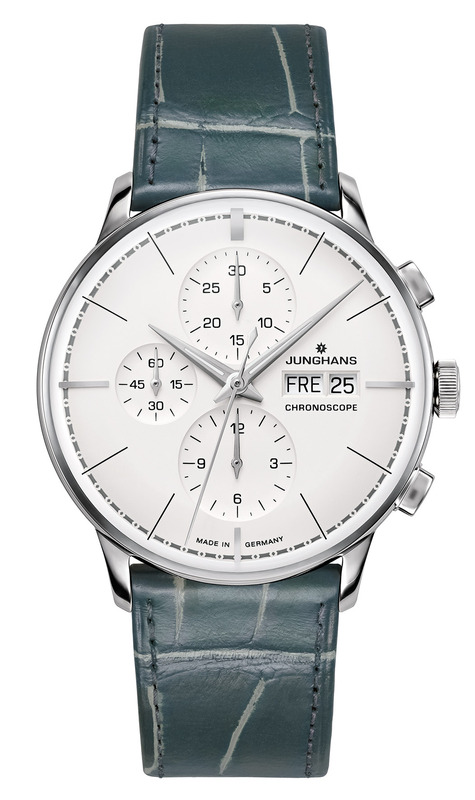 Junghans offers two different versions of this watch and both incorporate the distinctive elements of the industrial monument in Schramberg into their design: the minute track of the dial reflects the meandering design of the wall decorations in the terrace building, whilst the dark green of the wall tiles in the stairways can be found in the alligator leather strap. The case back delivers a direct view of the architectural work: an engraved image of the terrace building. Hours, minutes and the chronograph second are shown by central hands. The running second lies at 9 o’clock, the 30-minute-counter at 12 o’clock and the 12-hour-counter at 6 o’clock. The hands are coated with Lume and the dial is protected by a convex hard plexiglass with coating for enhanced scratch resistance. Inside the Meister Chronoscope Terrassenbau watches works an automatic movement, the J880.1. It offers a power reserve of up to 48 hours. The cases feature a diameter of 40.7 mm and are water resistant up to 3 atm. With a limited edition of 100 examples, the Meister Chronoscope Terrassenbau features a gold case. Inspiration for the champagne-coloured dial with the three matt silver subdials was the stairway of the terrace building, which are in beige and white. The stainless steel version is limited to 1,000 watches and has a silver-plated dial. 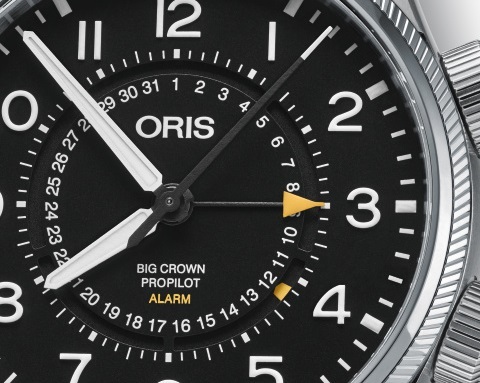 Oris revived one of its most hirstorc complications, the mechanical alarm. The new Big Crown ProPilot Alarm Limited Edition breathes new life into a complication that Oris first introduced in the 1940s. Fans of the manufacturer will be pleased that Oris has based the new Alarm on the Big Crown ProPilot, the company’s iconic pilot’s watch. After all, the story of Oris is closely linked to that of the aviation. The company was founded in 1904, at the dawn of aviation, and made its first pilot’s pocket watch in the early 1910s. That was followed by the company’s first pilot’s wristwatch in 1917. The Oris Big Crown debuted in 1938 with its oversized crown that allowed gloved airmen to make adjustments quickly and easily. Today, Oris’s pilot’s watch collection is full of watches that delights pilots and watch enthusiasts equally. 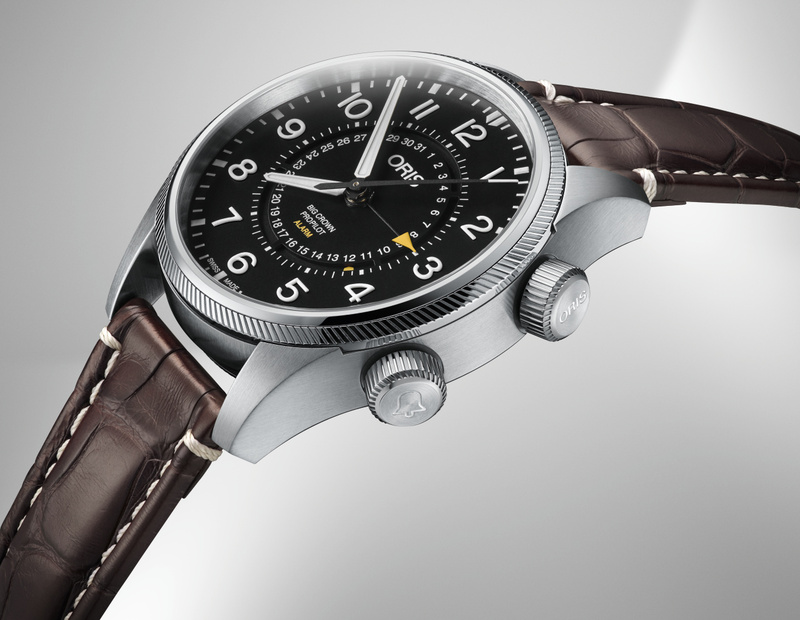 The Big Crown ProPilot Alarm Limited Edition is the latest expression of Oris’s pilot’s watch tradition. The watch has two distinctive features. The first is its alarm, indicated by a central pointer hand with a bright yellow tip. The alarm can be set to the nearest 10 minutes against a scale that runs around the outside of an aperture in the middle of the dial. That aperture houses the watch’s second key feature, a circular date display. Underneath it is a rotating disc with a yellow date marker that makes a full tour of the dial once every 31 days. As mentioned before, the Big Crown ProPilot Alarm Limited Edition is aesthetically based on the familiar design of the Big Crown ProPilot. In this case, the watch has two stainless steel oversized crowns, one to set the time between 2 and 3 o’clock, and a second to set the alarm between 3 and 4 o’clock. Both crowns are made of stainless steel and screw to ensure the watch’s water resistance to 10 bar. Otherwise, the watch retains the recognisable ProPilot look. Its signature bezel motif is inspired by jet engine turbine blades; the classic round stainless steel case and tapered lugs give the watch its stylish gait; and the fundamental dial design elements, such as the straight-edged hour and minute hands and large, luminescent Arabic numerals, remain clear and functional. The case houses the Swiss Made automatic movement Oris Kal.910. The Big Crown ProPilot Alarm Limited Edition comes on a dark brown croco leather strap with a stainless steel folding clasp. Oris will only be making 250 pieces of this watch.